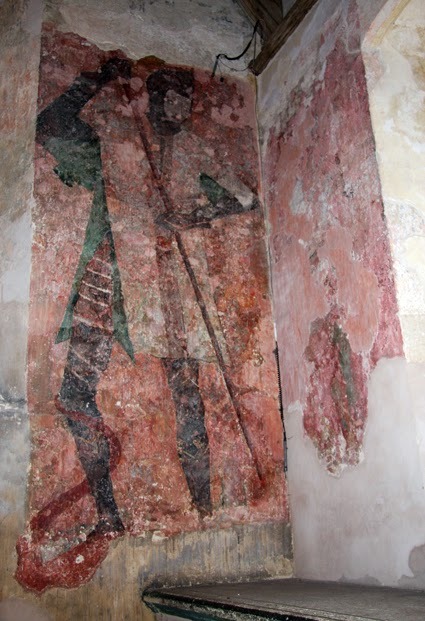 Today being St George's Day, here is a very early mural of St Geroge that is on the chapel wall at Farleigh Hungerford Castle, in Somerset. "The chapel of St Leonard stands in the outer court. It was built as the parish church by Sir Thomas Hungerford between about 1370 and 1383. The small north chapel...was added in about 1400 to house his tomb. It became the castle chapel in the 1440s... 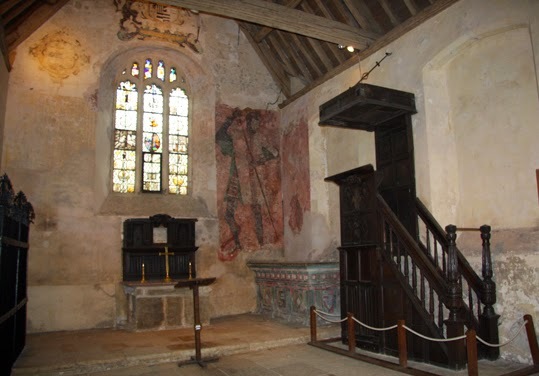 The east end of the main chapel displays the remains of earlier wall-paintings, including a nearly life-sized depiction of St George, probably commissioned in the 1440s by Walter, 1st Lord Hungerford." Although St George is a Christian saint - the patron saint of England - I like to view his dragon-slaying legend as symbolising facing one's fears, championing a cause - whatever that cause may be - and triumph in adversity.